As you know Tables are launching this month and I wanted to give you all a brief overview of what they are and provide some context for why we’re moving from CityGroups to Tables, and the main differences. Even if you are not a Table Leader I’d recommend you read on. Every table is an altar. For thousands of years Jewish rabbis have taught that every table is an altar, a holy space both deeply sacred and wide open to any and all who would come. A divine invitation of grace. They taught that this most normal everyday practice of eating with others around a table is actually shot through with profound meaning. The table gives us a picture of the gospel and something of the goodness of God. Where the body needs food, the soul needs connection and the table is a place where the need for both physical sustenance and human connection are met, where hunger is satisfied, where grace is experienced and people leave a little different to when they arrived. As followers of Jesus we can then look to his life and example of frequently gathering around tables and share a meal with anyone he encountered — the religious and the irreligious, the saints and the sinners, the rich and the poor, the powerful and the oppressed. He understood the importance and role of the table in 1st century Roman-occupied Palestine was to use the table as a power play, an exclusive staging of privilege. It was in this context that Jesus subverted the culture norms and practiced radical inclusion at the table, breaking bread with those who were so often excluded from the tables set in the homes of the rich and powerful. Of course before his death Jesus gathered his disciples around a table during Jewish Passover and initiated what has become the central practice for Christians ever since, the meal of bread and wine, the Eucharist or Holy Communion. CityGroups have been a core part of Redeemer from the very beginning. We gathered regularly in homes and public places long before we had anything that resembled Sunday Gatherings and although they went through many different iterations the core practice remained the same; a smaller expression of Redeemer gathering in homes and public places to practice community and live the way of Jesus together. Over the past few years the emphasis of CityGroups has waned to the point where many did not belong to one or gather regularly. This was for varying reasons but the constant, weekly rhythm of CityGroups throughout the year seemed to play a part, contributing to group boredom/monotony and leaders exhaustion. Often families found them difficult because they were always hosted in the evenings. We are launching Tables this week with the hope that everyone in our community would belong to one and they would become the central practice of community life in Redeemer. The language of table has been used in our community for sometime now, both in a metaphorical and literal sense, because we see it as both a central practice and defining picture of church community. When it came to rebooting community groups in Redeemer the name Tables felt appropriate. As we wrestle with the tension of being a city-centre church that wants to be a faithful presence on Donegall Street we also know that authentic community is only possible when we gather in each others homes right across our city, the surrounding towns and neighbourhoods. Tables are smaller expressions of Redeemer Central that gather twice a month in homes and public spaces to share a meal, grow relationships and learn together. They are formed based on location or common interest and are open to everyone — young and old, singles and couples, families etc. How are Tables different to CityGroups? Tables are intentional gathering spaces — ideally sharing a meal together — that seek to provide a safe and enjoyable place for belonging, community, meaningful relationships and the sharing of normal life together. We want to practice family together which means Tables are inclusive, and open to all including young and old, single people, families, children and youth. Some groups will gather based on location, others based on interest but no matter what, there should be a Table for everyone. They take place twice-a-month and in two seasons-per-year (Oct-Jan, Mar-June) because we value the importance of simple, sustainable rhythms that give us life and not busy calendars with hectic schedules. Tables are designed to be formational gatherings that encourage thoughtful reflection and participation in living the way of Jesus in the world. A shared ‘Liturgy’ helps enable this. The word ‘Liturgy’ means ‘the work of the people’ so when we say Tables are liturgical we means each Table gathering is designed in a particular way to help guide the journey of the group towards deeper engagement. To help this happen we have written a Table Liturgy that gives a pattern for each gathering to follow. You can read more about the Table Liturgy below. 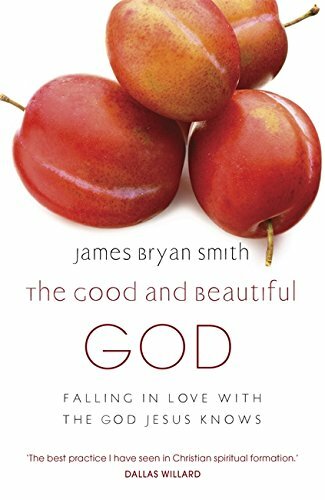 Throughout Season #1, Tables will be exploring the book The Good and Beautiful God by James Bryan Smith. We all have formed ideas about God as we have journeyed through life that affect our viewpoint of Him, some are true - but many are false. James Bryan Smith believes that these thoughts determine not only who we are, but how we live.